Info John Boehner (Bay-ner), elected to represent the Eighth Congressional District of Ohio for a seventh term in November 2002, continues to be a key leader in the fight for a smaller, more accountable federal government. Born in Cincinnati in November 1949 as one of 12 brother and sisters, John has lived in Southwest Ohio his entire life. He and his wife Debbie have been married for 28 years. They have two daughters - Lindsay and Tricia - and live in the northern Cincinnati suburb of West Chester. After graduating from Cincinnati's Moeller High School, in 1968, John earned a bachelor's degree in business from Xavier University in Cincinnati in 1977. Upon his graduation, he accepted a position with Nucite Sales, a small sales business in the packaging and plastics industry, and eventually became president of the firm. While working in the private sector, John entered the political arena - first serving as Union Township trustee from 1982 to 1984 and then as a representative to the Ohio state legislature from 1984 to 1990. In 1990, he was elected to represent Ohio's Eighth Congressional District in the United States House of Representatives. During his tenure in the House, he has worked consistently to reform the federal government. His first two terms in the House were marked by an aggressive campaign to clean up Congress and make it more accountable to the American people. In fact, during his freshman year, Boehner and fellow members of the reform-minded "Gang of Seven" took on the House establishment and successfully closed the House Bank, uncovered "dine-and-dash" practices at the House Restaurant, and exposed drug sales and cozy cash-for-stamps deals at the House Post Office. John was also active in education reform issues, despite serving in the minority at the time. In 1994, he passed legislation with strong bipartisan support allowing school districts to use their Title I funds for public school choice programs, under which parents could choose which public school their children would attend. Later, John was instrumental in crafting the Contract with America, the bold 100-day agenda for the 104th Congress that nationalized the 1994 elections. One of the Contract's cornerstones - the Congressional Accountability Act, requiring Congress to live under the same rules and regulations as the rest of the nation - bears the unmistakable imprint of his drive to reform the House. The success of John's reform-minded agenda earned him election to the House Republican leadership after the Republican election victories in 1994. While in Congress, John has never lost sight of the need for greater fiscal responsibility in the federal government - a hallmark of his career as a small business owner. As House Republican Conference Chairman in the 104th and 105th Congress, John was a powerful voice in the fight to force Washington to stick to the strict spending limits in the Balanced Budget Act. And in September 1999, as Vice-Chairman of the House Administration Committee, John joined House Speaker Dennis Hastert to announce the first-ever "clean" independent audit of the House - a reform he first called for as a member of the Gang of Seven in 1992. "It was a proud day for the man who joined the committee in part because of his expertise in accountability and advocacy of government entities run by private-sector principles," Roll Call, a top Capitol Hill news source, observed. In January 2001, John opened a new chapter in his congressional career when he was selected by House Republicans to chair the House Committee on Education and the Workforce. In accepting the post, John pledged to work with his committee colleagues - "Republican and Democrat alike - to make positive reforms for Americans from grade school to the golden years." As committee chair, he has helped deliver on President George W. Bush's promise to reform America's education system. In May 2001, the House passed John's No Child Left Behind Act, a bill based on the President's reform plan, with overwhelmingly bipartisan support. This success was highlighted by The Almanac of American Politics, which noted, "Putting together a bipartisan education package on a committee which has long been one of the most partisan in Congress was a considerable achievement. 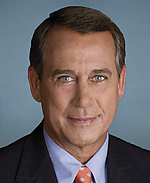 Boehner now seems to be a more powerful member than ever." On January 8, 2002 President Bush culminated more than a year of intense legislative activity by signing the No Child Left Behind Act in Hamilton - a city in Ohio's Eighth District. And he did so in what he called one of the most important places in America: a public school. On the heels of this historic success, Boehner is now leading his committee as it tackles a wide variety of other issues including retirement security, higher education affordability and quality, special education reform, and expanded school choice. Meanwhile, John continues to serve as Vice-Chairman of the House Agriculture Committee, on which he is a consistent free market voice for our Ohio's farmers and ranchers. In his leadership positions on both of these key congressional committees, John is certain to have a major impact on the national legislative agenda during the 108th Congress - which is good news for the Ohio families he represents on Capitol Hill.